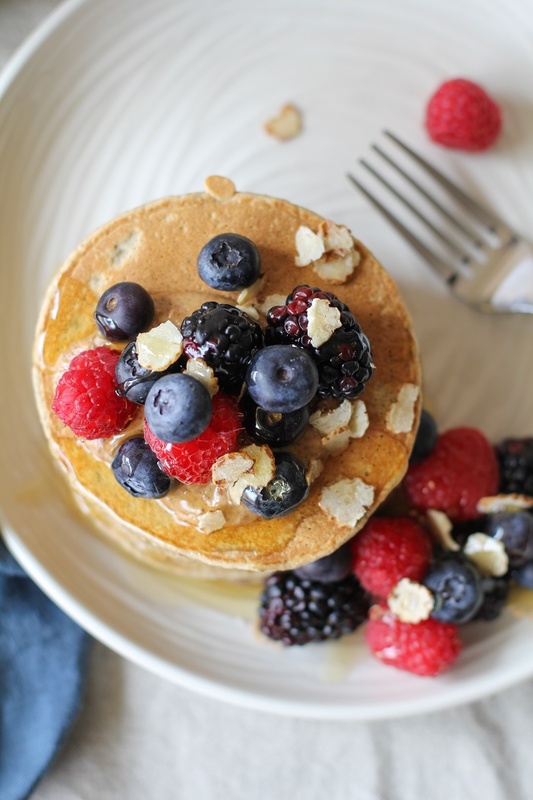 Fluffy tiger nut flour pancakes are a grain-free, high-in-fiber, paleo-friendly breakfast . 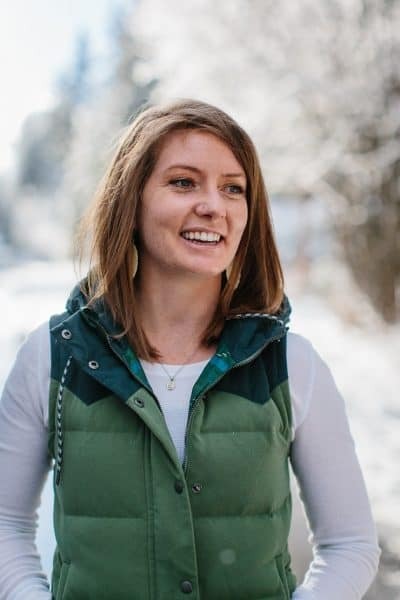 When I went to Expo West last month, I met with the folks at Organic Gemini, a company that makes awesome, quality food products centered around tiger nuts. As I sampled their raw granola and all of their delicious Horchata drinks, I instantly knew these products would nestle their way into my kitchen. Excited to add a new gluten-free and/or grain-free flours to my baking arsenal, I connected with the brand. It only took a couple of recipes using Organic Gemini’s TigerNut Flour for me to fall in love with the stuff. Not only is it super forgiving compared to other grain-free flours (as in, you don’t have to have the perfect golden ratio of eggs-to-fat-to-liquid-to-flour), but I find it’s much easier on my digestive system than almond flour and coconut flour. Plus, when combined with tapioca flour, the texture of tiger nut flour goods is super similar to whole wheat. I’m now envisioning baking every muffin known to man with this magical mixture. n spite of the large role the little tubers have played in cultures overseas, they haven’t created waves in North American cuisine until recently because growing conditions for the planet aren’t ideal in the U.S. Tiger nuts can be consumed raw, roasted, dried, ground into flour and baked or a hydrated into tiger nut milk or pressed into oil. Typically, the round tubers are dried before storing to prevent spoilage and are typically re-hydrated before consumption. A great source of Resistant Starch, which is a prebiotic fiber that resists digestion and fuels our healthful probiotic bacteria. Has a somewhat grainy texture similar to almond flour. When combined with tapioca flour, you get a fluffy consistency, similar to regular whole wheat or all-purpose flour. Contains a nutty, somewhat buttery flavor. I’d compare the flavor to lightly buttered popcorn. Can be used in baked goods from cookies and bars to quickbreads, and even pancakes, as shown in this recipe. To get more information about tiger nuts and TigerNut flour, check out this page. If you want to get really fancy with the recipe, you can replace half of the milk with a ripe banana for banana bread-style pancakes. You can also use full-fat coconut milk instead of almond milk for richer flavor, and add any sweetener of your choosing to the batter. Feel like shredding up a carrot to make mock carrot cake pancakes? Go for it! Wanna add some gluten-free rolled oats and raisins to have a sort of dessert-for-breakfast oatmeal cookie pancake situation? You do you, m’dear. As you can see, I enjoyed the pancakes with fresh berries, almond butter, sliced TigerNuts, and honey. You can go the butter and maple syrup route, opt for peanut butter and banana, make a fun and frisky fruit compote, make a pancake breakfast sammie with eggs, sausage, bacon, ham, you name it! 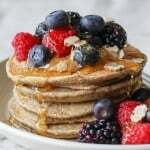 There are plenty of options to turn this basic recipe for tiger nut flour pancakes into any dreamy hot n’ steamy stack of your choosing. This post is sponsored by Organic Gemini. All opinions are my own. 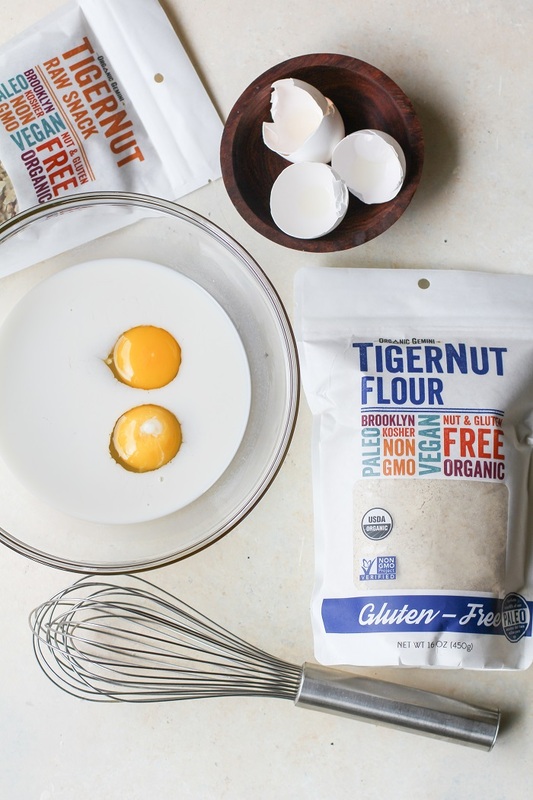 Aw man now I feel like I NEED to try tiger nut flour (I mean I do, right?). These sound super nutritious and look beauuuuutiful, i.e. I love these photos. What I reaaaaally love is the simple ingredient list–so doable. I have GOT to try this out! 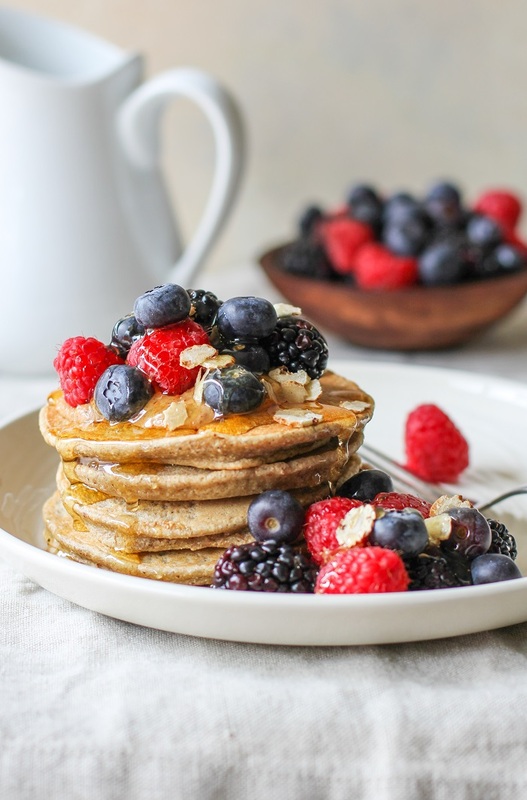 One of my problems with coconut flour is that it just doesn’t sit well with me, so I’d love to find an easier to work with and stomach-safe GF alternative 🙂 These pancakes are so fluffy! YES, I’ve found the same thing with coconut flour (and almond flour!). I haven’t experienced any digestive uneasiness with the TigerNut flour, so I hope you find the same! ERMAGERD that is the prettiest stack of pancakes I’ve ever seen in ma life! I’m seriously in love with these pics. Any suggestions for what might work in place of the eggs? I’d recommend using flax eggs (2 tablespoons of ground flax seed + 6 tablespoons of water. Mix the flax and water and allow it to sit for 15 minutes to thicken. Then follow the recipe as though the flax mixture were actual eggs). You could also try using chia eggs (same idea as flax eggs) or even 1/3 cup or applesauce or banana. Let me know if you try the recipe using an egg replacer! I can’t do flax or chia, either; but maybe the applesauce would work. Thanks for the suggestions. I wonder if a “gelatin egg ” would work. Try aquafaba as an egg replacement. It’s the water from canned chickpeas. I’ve been doing some research and looking around at vegan recipes on how to use it. Very intriguing and I will probably give it a try when I can work in the kitchen without summer distraction! I love this blog! Thanks for the recipe, can’t wait to buy the tiger nut flour and make these babies. These look amazing! I looove tiger nut flour and haven’t put it in pancakes yet. Now I know what I’m doing this weekend!! These looks great – I’m going to try them out with our kids soon :-). I need to try that TigerNut flour, sounds amazing. 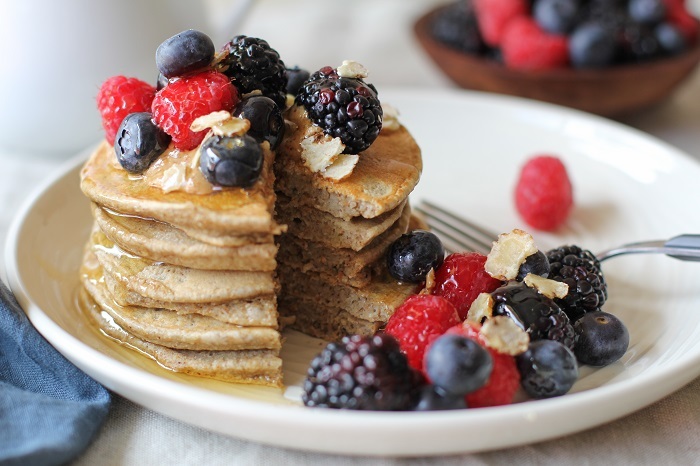 Amazing as these pancakes – seriously awesome! Interesting! I also never heard of tiger nut. Could you post nutritional values of the tiger nut flour? – Just to have a general idea about macronutrients it contains. Sure thing! You can find the nutrition facts for Organic Gemini’s TigerNut Flour on MyFitnessPal Here: http://www.myfitnesspal.com/food/calories/organic-gemini-tigernut-flour-302250520 🙂 Hope you give it a try! I had never heard of tiger nut flour. Sounds intriguing. Weird though that it’s not actually a nut… I’m not sure why people name things differently than they actually are lol. It throws people off! I love their products! I haven’t tried cooking with the tigernut flour yet though and these pancakes look fantastic. Thanks for creating it Julia. If you were to use tigernut flour as a coconut flour replacement, is the ratio 1:1? I use a bit of tapioca flour with all coconut flour recipes, as well. Hi Dalena, Tiger nut flour behaves similarly to rice or oat flour, so there wouldn’t be an easy conversion when replacing coconut flour. Coconut flour absorbs about 3 time the amount of liquid as tiger nut flour, so unfortunately, you’d have the play around with the other ingredients as well. Best of luck and let me know if you have any other questions! How many carbs are in these pancakes? Can I replace the tapioca but still get that fluffy taste? Hi Alia, I typically don’t check the nutrition facts on my recipes, but you can use a free calorie counter like MyFitnessPal.com to input the ingredients and get the per-serving nutritional info. You can likely omit the tapioca flour from the recipe, but I don’t think the pancakes will turn out as fluffy. Let me know if you try them! Thanks for this recipe! So happy to see NO coconut flour (makes me sick and it’s all anybody uses!!) but I am wondering… I can’t do tapioca but I can do arrowroot… do you think it could be sub’d? I tried them as written and found them to be too grainy as well. the taste was good and I could probably deal with the texture but my hubby said it was like eating sand so I’ll try the cookie recipes and see how that works. Hi Suzanne, Oh no! I’m sorry they didn’t turn out! Was the issue that they stuck to the skillet? I made these into waffles today by adding 1/4 cup almond oil. They cooked through, came out fluffy, tasted ok… recipe made 3 waffles… the only other thing I changed is that I used cows milk. Flavor is good, texture not so much. Fibrous and gritty. But, it was worth a try! Thank you for the recipe. Hello! I am so excited to try these, as my son LOVES pancakes but we are now egg, almond, and coconut free. He is also allergic to dairy, legumes, and we avoid gluten. Do you know if I could use flax or rice milk (or even water) instead of the almond milk? Thank you! Hi Andrea! You can use either flax or rice milk in place of the almond milk. Hope you enjoy! 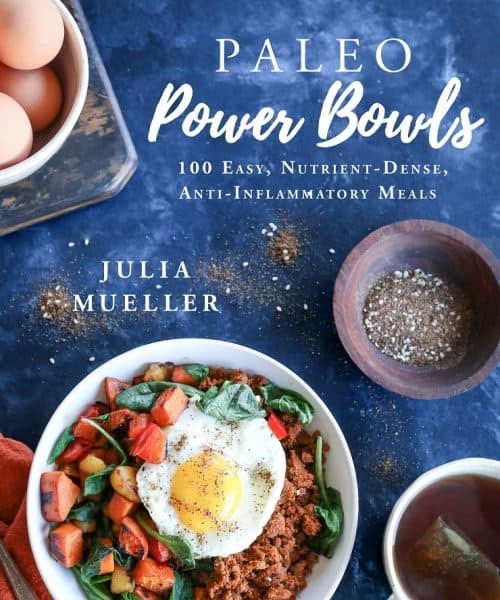 Pingback: 25 of the Best Paleo Tigernut Flour Recipes Plus What is Tigernut Flour? Hi there! You can try replacing the tapioca flour with more tigernut flour or almond flour, but doing so is definitely going to compromise the texture. 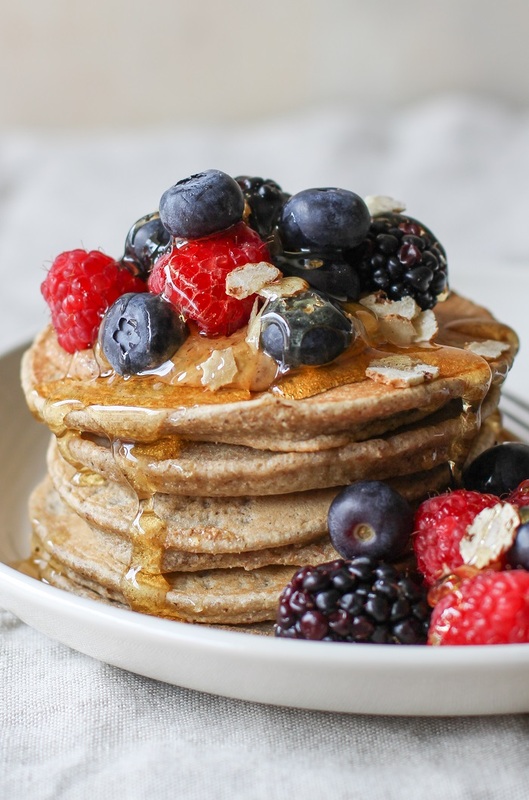 You want the tapioca flour to make the pancakes hold together and help make a fluffy texture, or else they will fall apart easily and be grainy and flat. You could replace the tapioca flour with arrowroot flour, but I’m not sure that helps in the carbohydrates department. Hope this helps! I wanted to love these but they were just too gritty and I did not enjoy the texture at all. Made the pancakes and they are amazing!!!!!!! I’m so happy to hear it, Krystyna! Thanks for letting me know!